The author wearing Google Glass. 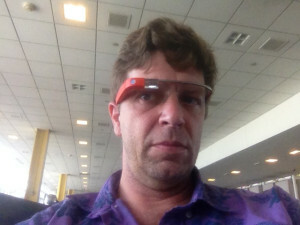 As I write this, it’s been almost 48 hours since I’ve picked up my Google Glass. As I settle in with the device and interface, my reactions are a mixed bag. The interface is a joy. Once you get used to the voice commands and the trackpad on the side of your head, it becomes reflexive pretty quickly, or at least it did for me. The voice recognition is excellent. That does not mean it won’t periodically flub, but the accuracy is way beyond Siri. At one point, I had an Italian woman try it on, and it had no trouble at all with her accent. This is where some of the pitfalls of pairing with an Apple device begin to make themselves apparent. If your Glass is tethered to an iPhone you can take pictures and videos and you can make calls, but the rest of the commands are unavailable, though you can still see them in the menu. The touchpad at your right temple provides additional controls. You can turn on the device this way if your neck starts to hurt from the tilt-to-activate standard. This is also what you use to navigate your timeline. Much like with Google+, there is a reverse chronological timeline of all your Glass activity — pictures taken, videos shot, texts received, Hangouts participated in, etc. You can navigate through these items by swiping forward, and share them or delete them. Right now sharing is confined to Twitter, Google +, and Facebook, but I am sure once the app ecosystem for Glass begins to grow there will be many other options. If you swipe toward the back of your head, you get to the weather and temp first, and then the device settings. This is where you can tether it to a smartphone, get info on the hardware/firmware version, and find a number of other pretty standard controls. It is also where you can switch it into Guest Mode. When you switch on Guest Mode you basically allow someone to play with all of Glass’ capabilities but without them seeing your private data. Their activity still shows up on your timeline but they cannot read your emails or texts. Since I intend to be studying people’s reactions to the interface as well as the hardware itself, this is going to get a lot of mileage. We’ve gotten used to the sniping back and forth and the hamstringing of the other company’s offerings over the years. The most obvious recent example is that there is still no Glass app in the Apple App Store. This limits a lot of functionality and has caused chronic problems for many people when it comes to accessing WiFi. I’ve been battling this issue myself because without working WiFi you cannot share from your Glass stream to your Google+ stream, much less on other social platforms. Without an app, setting up WiFi is a peculiar experience. You have to manually enter the data through a browser on an actual computer. It then generates a QR code that it scans by looking at it. From what I’ve gathered, this has proven problematic for other Explorers as well. The worst case (so far): Glass paired with an iPhone can have tethering issues depending on your provider. This can basically leave you with a super groovy Bluetooth headset that has a camera built in. Oh, for a world where this was the support standard. Every time I call ( yes, they give you a number at which you can reach Google directly), the staff is insanely courteous and helpful. In every instance, both pre- and post-pickup, I have gotten far more detailed assistance than I could have hoped for. On one occasion, I had a question that could not be resolved while I was on the line. Two hours later, I had an email with a ton of data, step-by-step fix-it directions, and PDFs of the manuals for the non-Google gear in the equation. Seriously? I got better support on a Verizon hotspot from Google than I’ve ever seen from Verizon? All in all, I have to say that this is the finest support I’ve ever received on any product. Right now the device is basically like the first iPhone when it came out. It is super cool, but there are very few apps for it. That is going to change fast. I believe it is pretty revolutionary and far more fun than I expected. Will it catch on with the general public? We won’t be able to tell for some time. After all, there is not even a retail version of Glass yet (2014 is the projected date). Whether Google Glass ends up catching on or not, this is the beginning of the next big change. Any user interface designer will tell you that the best Interface is the one that “gets out of the way.” In other words, the less you notice it the better it is. Glass is one of the fist examples of this design aesthetic being applied to hardware.